Hydraulic Breaker - Reach It! - Move It! - Crush It! Avant breakers are specially designed for use with Avant loaders. From three different models you can find suitable for all 300, 400, 500, 600 and 700 series models. Avant loader with breaker is a very efficient tool in demolition and refurbishing operations: do the demolition with Avant and breaker,take the debris away with Avant and bucket – very fast and effective. Another benefit of this combination is its compact dimensions: you can go almost anywhere with this unit. 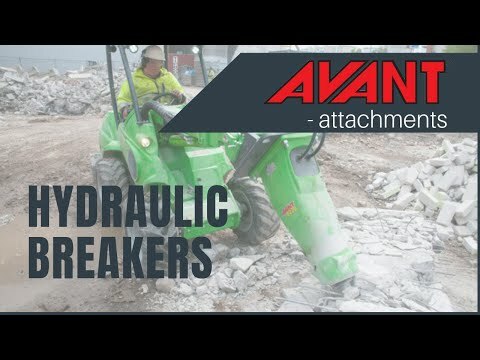 Avant breakers are the fastest, easiest and most efficient breakers for Avant loaders. All hoses, couplings and quick attach brackets are included in the package. In addition to this all set ups have been done to the breaker already at the factory so you can be sure you have a fully functioning package on the worksite. Breakers are pre-adjusted at the factory to suit Avant loaders. There is a breaker foreach Avant model.